Categories: 4 Thai, Food, Goffee Shop Tags: 4 Thai, Food, Goffee Shop, Recipe	Leave a comment ? A lot of people don’t like to drink coffee because of its bitterness. Now, there is a new discovery – the way to get rid of the bitterness. I found the story very interesting (read from BoingBoing). How interesting? I let you judge on that Ha Ha Ha. Categories: Food Tags: Food	Leave a comment ? Brandon just gave me a coupon that I can use get 2 piece meal from KFC. It comes with two pieces of grilled chicken, two individual sides, and a biscuit. Whoo hoo.. thanks to Oprah Winfrey Show!! This coupon is good until May 19, but not valid on Mother’s day (May 10). You can download the KFC coupon from this website – unthinkkfc.com. You can print up to 4 coupons per computer. Photocopy is not valid. Enjoy! Categories: Food, Miscellaneous Tags: Food, News	Leave a comment ? My cousin asked me if I had ever tried “Fried Coke.” I was like.. What??? What are you talking about? And, then she sent me pictures and the story about it. Whoa… it’s pretty amazing how the inventor, Abel Gonzales, Jr. come up with a very creative dessert. 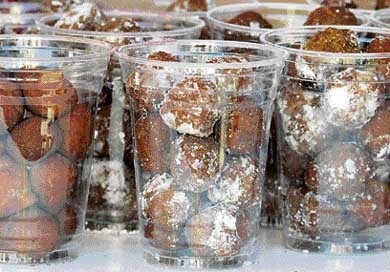 He introduced Fried Coke in 2006 at the State Fair in Texas. 1. In a medium bowl, mix together the flour and baking powder. 2. Mix in eggs and Coca Cola and stir until a smooth batter forms. 3. Preheat oil in a skillet or deep fryer. 4. Pour 1/3 cup of batter into a funnel or turkey baster and in a circular motion pour batter into the hot oil. 5. Fry up for about a minute on each side and drain on paper towels. 6. Serve while still warm and top with Coca Cola syrup, whipped cream and a maraschino cherry. Now, it’s your turn to try it out!! Categories: Borrowed Recipes, Food Tags: Borrowed Recipes, Food	Leave a comment ? Flan is a typical spanish style custard dessert. It has caramel sauce on the top. Flan is not eay to make, but with Jell-O technology. You can make it with ten minutes. Flan is so yummy!! It’s pretty easy to make it if you have an instant box hahaha. It turned out very well. With one box, I can make three cups of flan. Categories: Food, Goffee Shop Tags: Dessert, Food, Goffee Shop	Leave a comment ? While searching for a new cooking knife and other cool kitchen gadgets, I found an interesting knife’s name, called Santoku. At first I thought it was a Japanese chef’s name who invented the knife, but with my curiosity I googled it and found more details about it. Basically, santoku is a Japanese word translated as “three good things” or “three uses.” It’s a reference to the knife’s three cutting tasks such as slicing, dicing, and mince. Another word, santokuo is a general-purpose kitchen knife. What the differences between regular knife and santoko knife? Santoko is a modified Western chef’s knife. It’s shorter than most chef’s knives, thinner blade made of harder tempered steel, and thinner edge profile angle. There are some other modifications of the basic santoku originated from Japan. You might see some santoku knifes with some piercings or holes through the blade as well as different patterns of surface though out the body of the blade. Categories: Food, Technology Tags: Cooking Knife, Food, Gadget	Leave a comment ? I thought Mc Cafe was available only in the US. I just find out that Mc Cafe is available in Bangkok too. Some of you might not know that McDonald’s now serve all kinds of coffee – just like Starbucks. 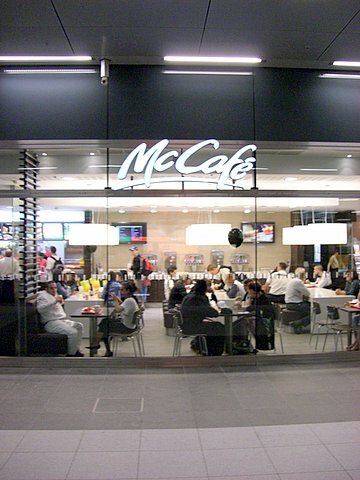 In Mobile, Mc Cafe is a coffee corner located inside McDonald’s. But, it seems like Mc Cafe can be by itself just like any other coffee shop. I love the ice coffee from Mc Cafe. Sometimes, I drove-through McDonald’s in the afternoon just to grab a big cup of Vanilla ice coffee. It’s a lot cheaper than getting it from Starbucks. Categories: Food Tags: Food, News	Leave a comment ? Au (my beloved long-time friend since grade 8th) and her two friends visited Mobile during the New Year holidays. We drove to New Orleans. Every time I pay New Orleans a visit, I had to stop by this place, called Cafe Du Monde. There are two famous things in the cafe – Coffee and Beignet. So, what’s the “Beignet”? The white powder on the top is sugar icing. This cafe opens 24 hours and seven days a week. It’s always packed with tourists. It’s so good that I wanted to eat the whole plate! Ha Ha Ha! Categories: Food, Phlog Tags: Food, Phlog	Leave a comment ?